Karen Bass was born on October 3, 1953 in Los Angeles, California. During her high-school and college years, she volunteered to work on political campaigns and was active in the civil-rights and anti-war movements. In 1968 she served as a precinct captain for Robert Kennedy’s presidential run. After earning a BS in Health Services from California State University in 1990, and an MA in a Physician’s Assistant (PA) Program at the Keck School of Medicine, she went on to work as a PA for nearly a decade. She was also a project director for the Health Careers Opportunity Program from 1986-90, and an adjunct instructor at Cal State from 1989-96. A longtime proponent of normalizing U.S. relations with Communist Cuba, Bass in 1989 made the first of her three trips to that country. Soon thereafter, in a May 19, 1989 guest appearance on the KPFK Radio program Voices of the Left: A Socialist Perspective, she discussed her observations and opinions regarding life under Fidel Castro. On one of her subsequent visits to Cuba (June 2011), Bass was accompanied by Democrat strategist Donna Brazile, former Congresswoman Jane Harman, and Center for Democracy in the Americas director Sarah Stephens, whose organization paid Bass’s travel costs of $2,915. In 1990 Bass founded the Community Coalition, a Los Angeles-based social justice group, to help “shift the policy agenda” vis-à-vis the war on drugs “away from law enforcement [and] toward a public health and economic response.” She went on to serve as the group’s executive director until 2003. In the aftermath of the deadly April 1992 riots that erupted in Los Angeles following a widely publicized police beating of a drug-impaired, belligerent motorist named Rodney King, Bass encouraged local foundations as well as businesses and community leaders to invest in grassroots, community-based activist groups as a means of addressing the societal injustices that allegedly were the root causes of the black rage that had fueled the riots. After serving six years as a member of the California State Assembly, Bass in 2010 was elected to succeed the retiring Diane Watson as the Congressional Representative for California’s 33rd District. She continues to serve in the U.S. House of Representatives, though in 2013 her district was renumbered as the 37th. Bass is a member of both the Congressional Black Caucus and the Congressional Progressive Caucus. In a May 2005 exchange on the Yahoo group AztlanNet News, Los Angeles Communist Party USA organizer Rosalio Munoz revealed the activist connections that he and fellow Communist Leroy Parra had maintained with Bass in the early 1980s. Munoz also stated that Bass had once been a member of the Venceremos Brigades, which Fidel Castro‘s Cuban intelligence agency organized and trained in guerrilla warfare techniques, and which covertly transported hundreds of young Americans to Cuba to help harvest sugar cane and interact with Havana’s Communist revolutionary leadership. In September 2009, Bass co-hosted the Council on American-Islamic Relations‘ 6th Annual Ramadan Iftar dinner — the evening meal with which Muslims end their daily Ramadan fast at sunset — inside the Capitol Rotunda in Sacramento, California. In January 2015, Bass objected strenuously when Republican House Speaker John Boehner—without first asking President Obama for his approval—invited Israeli Prime Minister Benjamin Netanyahu to speak to Congress about the gravity of the growing Iranian nuclear threat and his “profound disagreement” with the deal that the Obama Administration was pursuing with Iran. Bass was one of numerous Black Caucus members who boycotted the speech. During her tenure in Congress, Bass has voted against permitting oil drilling in the Outer Continental Shelf; against barring the Environmental Protection Agency from regulating greenhouse gases; against maintaining a work requirement for welfare recipients; and against reauthorizing the DC Opportunity Scholarship Program, a school voucher initiative which was designed to enable the parents of poor, inner-city children in Washington to send their youngsters to private schools rather than to DC’s abysmal public schools. For an overview of Bass’s voting record on a broad array off key issues, click here. 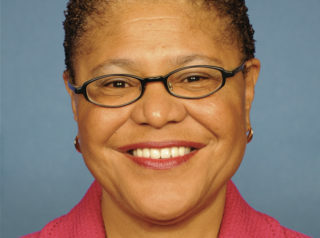 Further Reading: “Karen Bass” (Keywiki.org, Votesmart.org, KarenBass.com, OnTheIssues.com); “Rep. Bass Applauds Moves to Normalize Diplomatic Relations with Cuba” (Bass.House.gov, 12-17-2014); “Dem. Rep Changes Twitter Picture to Trayvon Martin” (National Review, 7-18-2013); “56 Democrats to Skip Netanyahu Speech to Congress” (The Hill, 2-9-2015); “Democratic Congresswoman: We Need an African American On The Supreme Court, Clarence Thomas Doesn’t Count” (Washington Free Beacon, 2-28-2016); “Karen Bass Accuses Trump Administration of ‘State-Sponsored Child Abuse’” (Daily Caller, 8-3-2018); “Dem Rep. Bass: Silly, Offensive for Trump to Cite Unemployment Stats to Say ‘He’s in Love with African-Americans’” (Breitbart.com, 2-4-2019).